MLA Stewart Dickson has presented the Larne Line Passenger Group’s petition to reinstate the former Larne rail timetable to the Assembly. Mr Dickson travelled to Stormont with representatives from LLPG, who have gathered over 2,300 signatures in support of returning the local service to the timetable which was in place until this September. 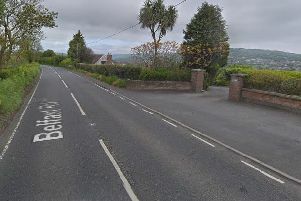 Mr Dickson commented: “Since the beginning of September, the people of East Antrim have been dealing with a downgraded railway service as the result of timetable changes. Following the presentation of the petition to the Speaker of the Assembly, Mr Dickson and the LLPG representatives met with Regional Development Minister Michelle McIlveen to discuss their concerns. “We had productive meeting with Ms McIlveen, and I am happy to see that the DRD and Translink are truly starting to listen to the people of East Antrim,” Mr Dickson continued. “However, ultimately it is the actions taken to solve this issue for passengers that we will judge the sincerity of their engagement. Mr Dickson was due to meet with Translink Chief Executive Chris Conway to discuss the petition and the desire for additional park and ride facilities on Tuesday November 3. “We fully understand that Translink is facing huge budget cuts,” stated Mrs Aceves-Cully. “Our case is that the Larne Line, which already have a much more inferior level of service (74 daily Monday to Friday services to Carrickfergus and 34 to Larne as opposed to 100 to Bangor), has again being cut to a much higher degree than the likes of the Bangor Line. “The cuts made there are minimal and almost unnoticed given the much wider choice of services. “With the safety works improvement now underway at Ballycarry Station and the new Gobbins Visitor attraction, this area has strong potential for growth. “What is preventing this growth is the lack of park and ride facilities at locations like Ballycarry (Whitehead’s being oversuscribed) and now these cuts. “We asked Translink in January not to consider any cuts until the safety improvements to Ballycarry had allowed for passengers to try the improved access. Mrs Aceves Cully thanked local organisations, businesses and churches who had collected signatures for the petition. The petition will be handed to Translink’s Senior Management at the Group’s AGM, which is open to the public, on Wednesday November 4 at the Gobbins Visitor Centre in Islandmagee. The event will start at 7.30pm. “We hope for a good MLA/MP and passenger turnout,” Mrs Aceves-Cully continued. “This is their chance to show they really want to protect and improve this Line.